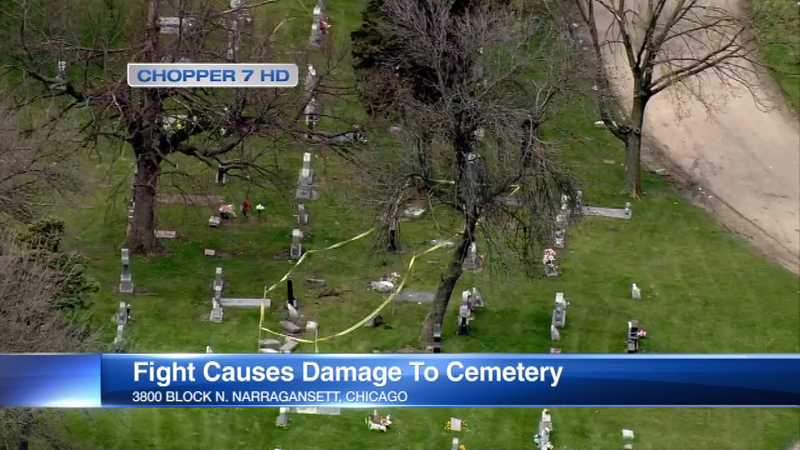 CHICAGO -- Several headstones were damaged and five people were arrested during a fight at Mount Olive Cemetery on the city's Northwest Side. The fight, which may be gang-related, caused thousands of dollars in damages. "We are extremely disappointed that the actions of these individuals have impacted our client families. We are reaching out to our client families to make them aware of what occurred and to share the authorities' contact information," a cemetery spokesperson said through a statement. Lorraina Medrando, 23; Lukasz Boufal, 18; Mario Martinez, 18; Jonathan Martinez, 24; and Ashley Bruno, 39; were charged in the incident. Medrando faces a felony count of criminal damage and the others face charges of disorderly conduct.